Thank you that helped me somewhat decide, but do you think alto flute is more of a jazz type of flute. If I get the piccolo flute do you think it would sound good in jazz pieces/ solos ? 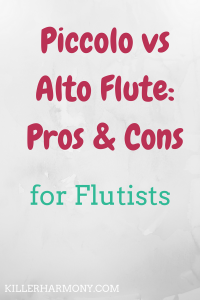 I don’t know much about jazz, but I do think alto flute is more common in jazz than piccolo. However, if you’re more interested in piccolo and you want to play jazz, you can definitely make it work! Some jazz flute music is in the high register, so I don’t see why that kind of stuff wouldn’t work on piccolo.